« Do Economic Crises Produce Liberalization or More Statism? I think some partisan economists look at the economy from a static basis. They think because you will likely collect more taxes the first few years that future growth rates are static and don’t respond to incentives/disincentives. This is a bit of an abstract and simple example, but many liberal economists greatly discount the incentives that promote innovation and ensuing growth. Some believe much innovation just occurs as some natural phenomenon impervious to the economic environment. As has been pointed out before, why doesn’t Europe have anything that remotely compares to Silicon Valley and its technological prowess? If you want to see more on this, you can visit my site CaseForCapitalism.com and look at the ‘foundation’ post with the word Spectrum. It seems that the growth maximizing tax rate should be zero, no? But even better than more cash in people’s pockets are the improved incentives to work, save, and invest. As John Kennedy said in the 60s, “it is a paradoxical fact that reducing taxes, increases revenue to the Treasury”. 2/3rds of the US economy is consumer spending So if people have more money in their pocket, they will spend or invest it, resulting in a growing economy which increases revenue to the treasury. I would like to see an extended model of the Laffer Curve reflecting revenues from several taxing authorities as each one independently raises taxes. For example, in Connecticut residents have both a Federal and State income tax. 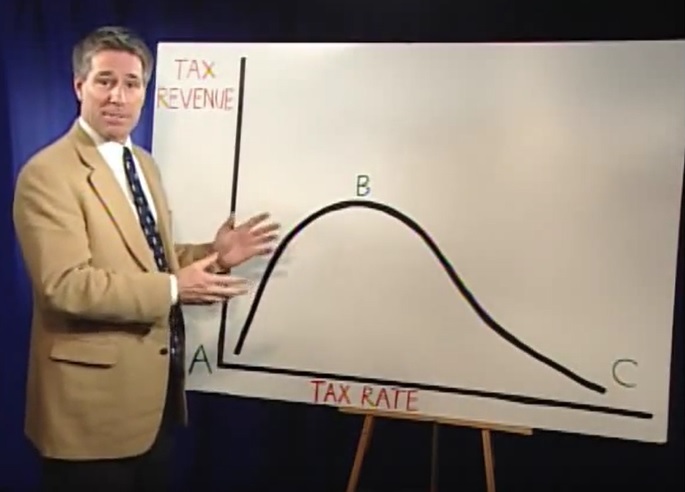 How does the additive sum of the two relate to the curve and revenue each might expect to gain or lose by increasing taxes? For example, let’s say there is a 28% Federal tax rate and a 6% State tax rate. I would expect a one percent increase in the state income tax to reduce federal revenues, but increase state revenues.